Scroll down this page for a map. Come, gather seeds & learn about gardening in the PNW - whether you can contribute seeds or not. We'll have plenty of seeds for this year’s garden. If you bring seeds to share Please make sure they are no older than 3 years, or you have tested their ability to germinate. You may bring leftover seed packets and/or your own home grown seed. More info on contributing seed on our SEED SAVING page. There is no charge to participate However, the Seed Exchange is supported entirely by your donations. Please bring some CASH to contribute if/what your budget can afford. There will also be some small scale seed farmers selling seeds, and the FFA club selling potted flower bulbs. A simple lunch is offered for your donation too. To collect seeds at the exchange, bring small envelopes and markers for labeling seeds. There are instructions for two different handmade seed envelopes on our SEED SAVING page. We will have limited supply of envelopes available by donation but are likely to run out. 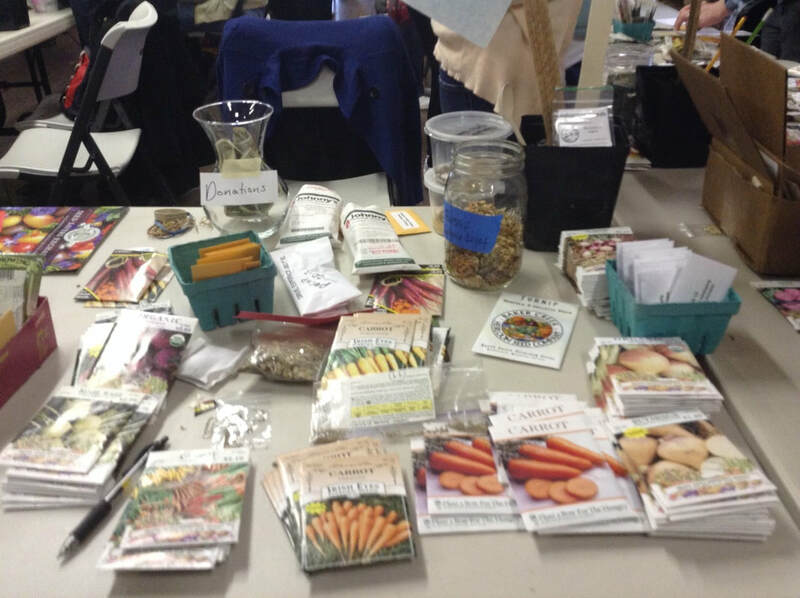 The Seed Exchange is a community event with lots to do, learn and see. Garden talks and demonstrations will be going on throughout the day, Look over this page carefully for details on the day! Come early and allow at least an hour to enjoy all the events. King County Librarians will attend with gardening and seed books for you to check out. Lunch at the Seed Cafe: Enjoy a delicious selection of soups and baked goods while at the Seed Exchange. The Seed Cafe is a volunteer based program with an 100% cash donation menu supporting the Seed Exchange. There are a variety of volunteer opportunities available to choose from. More details on benefits & tasks on our volunteer page. Volunteers are especially needed in the afternoon. Individuals can participate for as short as an hour or for the entire day’s schedule. All volunteers get the benefit of collecting seeds and seed catalogs an hour before the Seed Exchange opens to the public. 11:40am How to Make Fermented Ying Yang Carrots with Linda Harkness, the Kitchen Manager for Firefly Kitchens, a local company that creates delicious and nutritious organic fermented foods. She is passionate about the role of food in health and healing, and enjoys teaching others how easy it is to do your own fermenting with simple, low cost equipment. ​Lasagna Gardening with Larisa Ignacio: Learn how to add nutrition to your existing garden beds or easily create new ones using this practical and efficient method of layer gardening and no need to rototill! How to Plant Seeds for Home Success Tips on starting from seed with Seth Thomas, 14 years the Grow Manager at Flower World, FFA teacher and youth leader. Flowers and produce are his specialty. Seth will share his philosophy and methods for starting seeds. How to Propagate Herbs (Multiple Ways) with ​EagleSong Gardener, an American herbalist, lifelong gardener, pilgrim-adventurer living in the Pacific Northwest. She is founder of RavenCroft Garden in Monroe, WA. Why Wintersow? with Melody Granillo. A demonstration of some techniques to help jumpstart your garden. Melody Granillo is a Central Washington farm girl struggling to garden in a temperate rainforest. ”Let Your Seeds Save Themselves! Duvall's own Sarah Cassidy will offer us her own spin on seed saving this year. Sarah Cassidy has been farming for over 25 years. She has taught adults and children the art of growing food in many venues: as Seattle Tilth’s Garden Coordinator, as Oxbow Farm’s Education program creator and director, PCC Cooks, and Edmonds Community College’s Agroecology Program. In 1999, she and her husband Luke Woodward founded Oxbow Farm, which they managed for 17 years. They now run Hearth Farm in Duvall, WA. Sarah's talk will begin at 11:30 am. ​the Deep". Darien's talk will begin at 12:30 pm. "Straw Bale Gardening For Easily Customizable Spaces, Big Yields & Affordable!" with Pamela Morris, self proclaimed “plant whisperer and micro gardener". She has a love for clean, sustainable food, using small spaces to maximize productivity. All while watching the budget. Pamela's talk will begin at 1:30 pm. ​Unfortunately, Ea Murphy has had to cancel her soil talk. Beginning at 12 noon, the Duvall Future Farmers of America (FFA) student group will give three dramatic readings of “Who Grew My Soup”. Our usual simple activities for small children will take place at a hands-on “Kids table”. Parents please supervise your children at all times. 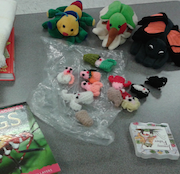 We provide activities for small children but do not provide child care! Here's your chance to spend! Cedarcrest FFA Club will have potted flowering bulbs for sale! Bring cash or card to purchase. Dancing Crow Farm will be selling seeds grown right here in the Snoqualmie Valley—bring some cash to purchase. Chris Homanics is likely to join Sean of Dancing Crow, with his unique varieties. Resilient Seeds Krista Rome will be back, selling seeds for Northwest staple crops, grown in Whatcom County. Garden Signs by Colin Keizer! King County Library bring your library cards to check out gardening and seed saving books. Duvall Farmer's Market Hooray for local food! Hopelink Harvest sharing information on their gardening & gleaning. Carnation Farms promoting environmentally sustainable practices that connect people and communities to land. Sno-Valley Tilth we are now part of this local farmer's non-profit, advocating and educating for local food & farmers. EagleSong Gardener herbalist and herbal educator. Jerry Johnson of Newtville Farm giant pumpkin farmer. Snoqualmie Valley Beekeepers will be there sharing information on keeping honeybees—but the bees will NOT be with them.